It's Ecoboost or nothing for the 2015 Ford Expedition, which gets MyFord Touch for the first time and a fancy Platinum edition to go with the fact it loses V8 power in favor of the 3.5-liter Ecoboost V6. After seeing the 2015 Lincoln Navigator, it should come as no surprise the 2015 Expedition is not at all a clean-sheet revision. Revealed at the DFW Auto Show in Dallas, the shape stays the same, but the new grille applied on the Expedition looks much better than what's been grafted onto the Lincoln. The interior looks similar, but there are screens in the instrument panel and an 8-inch one in the center stack for the MyFord Touch. Still, there are critical upgrades under the skin, chief among them being the turbo V6 that lies beneath. It also gains adaptive dampers and electric power steering. How modern. The Platinum Edition follows a successful formula from the F-150, besting the former top-trim King Ranch with "buttery" leather, according to Ford's people. Oh, and it has LEDs. If the Platinum isn't your taste, XLT, Limited and King Ranch trims all return for 2015. 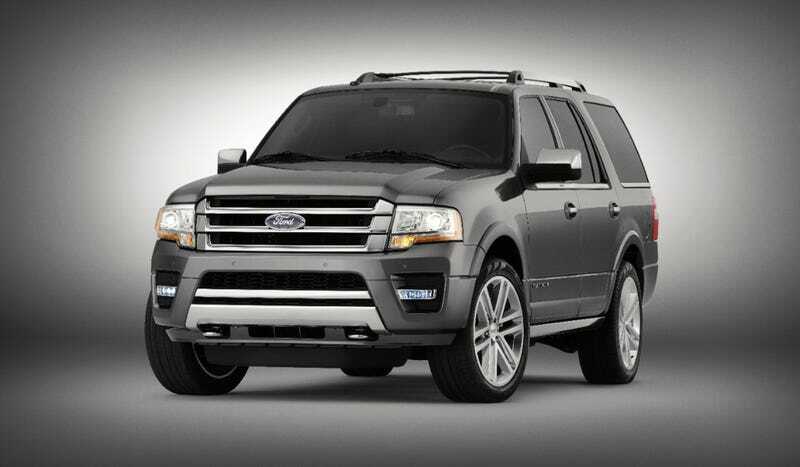 The 2015 Expedition will still be available in two lengths when it goes on sale later this year.